Source: Durham Korean and Vietnam Wars Monument, photo by Donald Burgess Tilley Jr. 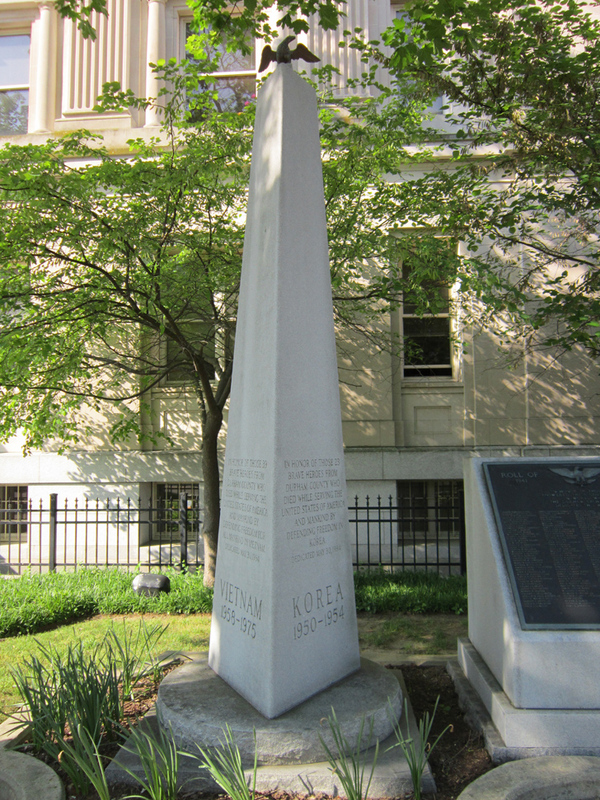 This three-sided obelisk is a memorial to those from Durham who lost their lives in the Korean and Vietnam wars. One side commemorates the 23 who lost their lives in the Korean War while another is dedicated to the 39 from Durham who lost their lives during the Vietnam War. On the third side is inscribed a quotation. An eagle sits with its wings spread atop the obelisk. Rear: For those who fight for it, freedom has a flavor that the protected will never know. Located in front of the Durham County courthouse, this monument stands next to the Durham County World War I and the Durham County Worl War II Monuments. There is a Confederate monument on the other side of the entrance to the Old Durham County Courthouse building. The monument stands in a grass area surrounded by shady trees.